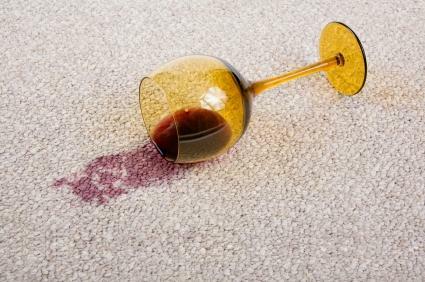 If you ever have dinner parties, or other occasions where you serve red wine in your home, you will need to know an essential skill: how to remove red wine stain from carpet. At some point a spill is going to happen, whether it happens today or five years from now. Luckily, people have been dealing with just such an occurrence for many years, so there are several proven techniques you can try. Before doing so, prep the stain if you can. It will make your job easier. Blot the wine as soon as possible after the spill occurs using a white cotton cloth. Don't rub or you will just grind the stain in deeper. Pour a teaspoon of table salt or talcum powder onto the stain to absorb as much of the remaining wine as possible. Sprinkle as opposed to dumping it all in one place. Vacuum. Pour a tablespoon of club soda onto a sponge. Use the sponge to dab at the stain. Rinse and reapply more club soda as the sponge becomes saturated with the wine. Fill a bowl with a cup of warm water and a tablespoon of ammonia. Stir. Dip a white cloth in the mixture until saturation. Wring out the cloth, only so it doesn't drip elsewhere on the way to the carpet. Keep it very wet. Dab at the stain until it is saturated. Use a new cloth to blot up the liquid. Repeat step two using undiluted white vinegar. Blot at the liquid again. You should notice the wine being picked up. Fill a bowl with a half cup of warm water. Use your white cloth to blot the stain, as before. Add a half cup of water and one and one half cups of water to a new bowl. Stir. Apply the paste to the stain using an old toothbrush. Let paste dry. Then vacuum. Pour a cup of white wine over top of the red wine. It should make the color disappear. Your carpet will not be clean, per se, since it will still have wine in it, but the color will no longer show, or at least it will fade considerably. 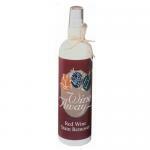 Wine Away Red Wine Stain Remover - Spray wine away on the spot and let it set for 20 minutes. Blot the stain. Repeat as needed. Spot Shot carpet cleaner - Shake the can up and down. Spray the cleaner on the stain. Blot. Repeat as needed. Remove any cleaner residue with water. Quick'n Brite spray cleaner - Mix three tablespoons of cleaner with one quart of water. Apply paste with an old toothbrush. Blot carpet with a damp cloth. Because every carpet is different, there is no guarantee that all or any of these methods will work on yours. It's best to test each solution you'd like to use to remove red wine stain from carpet in an area that won't show, such as underneath the sofa, before trying it in a more obvious place. If you have very delicate carpeting or you aren't sure if your rug is color-fast, it's best to talk to a carpet cleaning professional instead of trying to remove the stain on your own. Remember, if something doesn't remove a stain completely the first time it is perfectly okay, and even recommended, to try, try again. Or you can always buy a wine colored carpet.